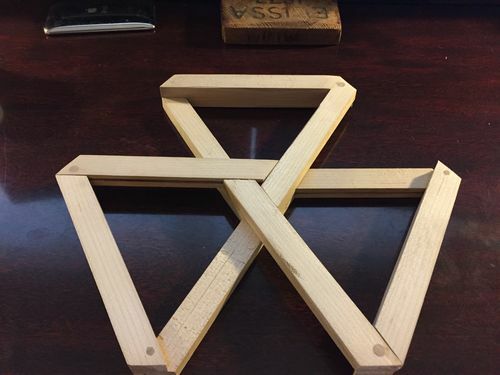 Lazyman posted his sliding trivets a few years back, and after a lot of banging around, I Put together one of these, but there were a few problems with my design; the pieces tended to want to come apart, and I wanted something to hold the trivet together so that you couldn’t easily slide it apart. After a little knocking around and a suggestion from my mother, I came up with the item below. So. Pieces are milled to 3/8” thickness and 3/4” width. I use “select” pine, but you can use whatever wood/scrap you have. I designed this to use 12 pieces cut to 6” length, so with the above thickness and width, You can make a single trivet out of a 14” piece of 1” x 6”. You can vary the lengths and widths of the individual piece as long as all 12 are the same dimensions. Then it all comes down to everything being the same length and accuracy in the cut of the 60 degree angle. To help with that, I built the cutting jig that attaches to my miter gauge. 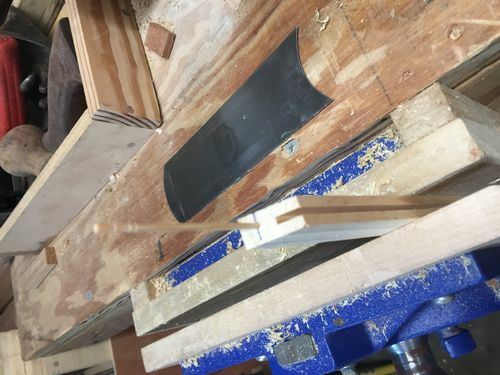 I use the slot from the cut to align the gauge to the blade. 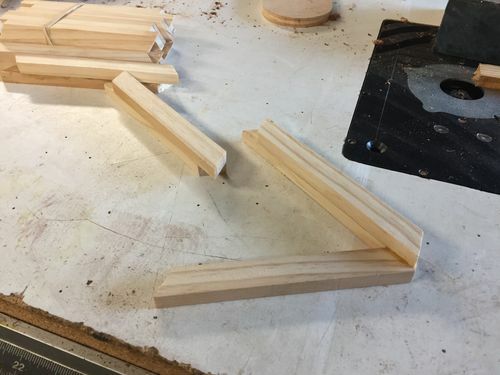 Each trivet requires 12 equally cut pieces of wood. Now that we’ve got that cut, on to the glueups. First, the bases. 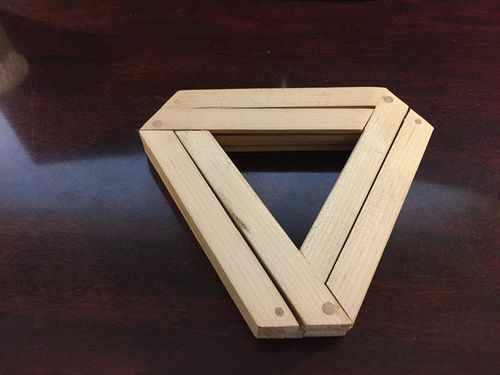 Two pieces, opposite orientation, with a face on each side having an open triangle of wood for the legs. Before gluing the “legs” to each base, I run a dado slot down the center the “inner” side of the leg. 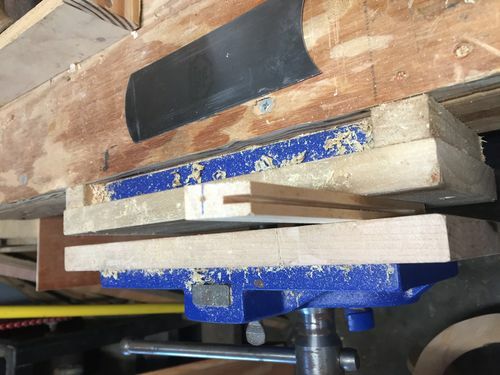 I used a stop block on my table saw to prevent the dado from going through the other end. Note the line on the end of the leg. I use this as a reference point for drilling the hole for the dado-guide. 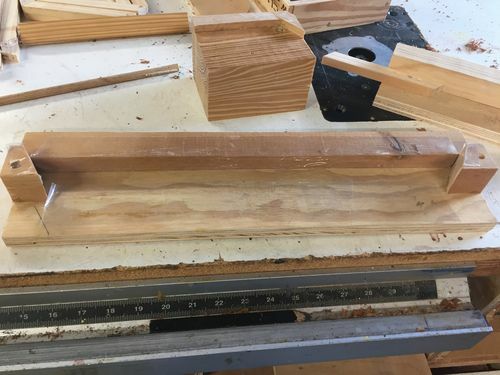 Depth of the dado is 1/4”. I use an awl for starting the guide hole, then drill w/ a 1/16” drill bit on my drill press. Basically, looking for a hole parallel to the inside dado. 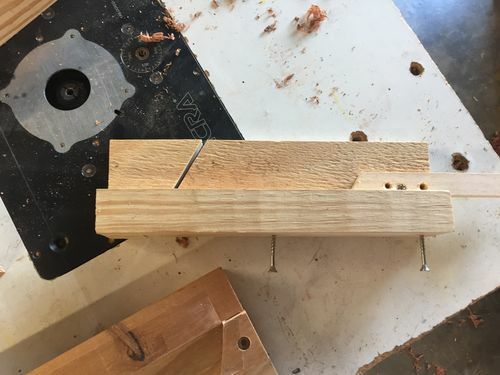 I glue a toothpick into the hole to act as a guide in the dado. This keeps the whole assembly from falling apart. 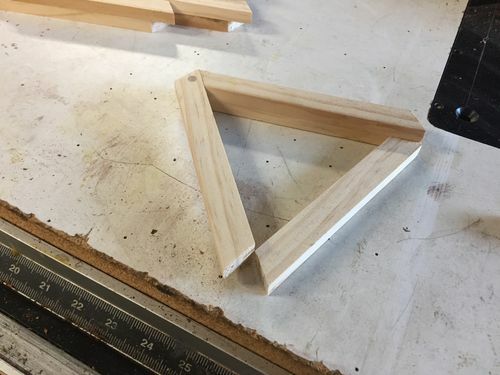 Now I glue the legs to the base so that they form an open-ended triangle. 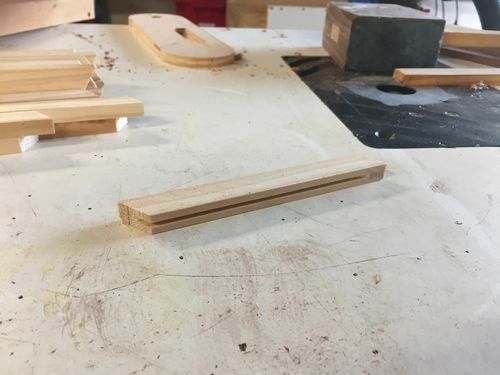 Once the glue-up is completed, I drill a hole where the leg meets the base, with the leg on top, ith a 3/16” bit and use a 1/4” dowel to strengthen the ending joints. 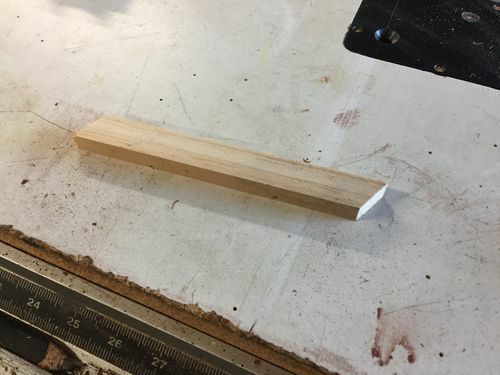 I tried using a 1/4” drill bit but the dowels felt too loose for what I was trying to accomplish. Depth of the drilled hole is 1/2” (I don’t want to penetrate the base). You can see the dowel in the upper left section of the photo above. You may notice that the toothpick has not been glued into the recess yet on the last picture. The addition of the toothpick can happen any time before final assembly. 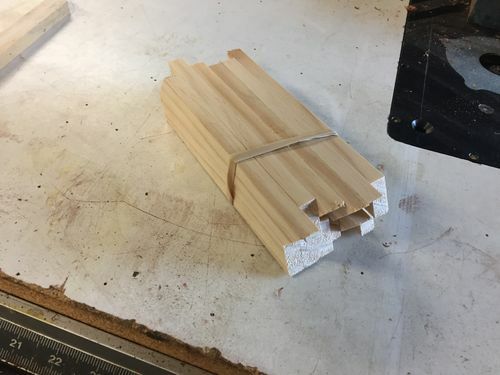 Fitting the pieces together is a little tricky, but you’re basically trying to fit the guides into the channel, and the orientation should be such that the end face of one leg will slide along the inner face of the leg so that the guide toothpick piece will ride within the dado. Once assembled, there are two final steps before I consider the trivet completed. First, the stop. This is to prevent the trivet from being pulled completely apart. If you wish to skip this step, hey, it’s just a suggestion. 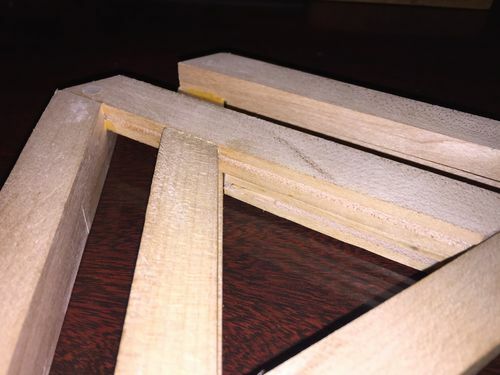 I glue a small wedge in at least two legs near the end of the leg closest to the open end of the base triangle. This needs to be about 1/2” to 3/4” (or 2/3 to equivalent width of your individual pieces). I’ve tried to get a good picture of it but it’s not a great visual. If you look carefully along the bottom dado you can see the wedge glued into the slot. This prevents the guide from pulling past the end of the leg. I glue two wedges in this manner, though one should suffice. Finally, once the wedge(s) are glued in place, I apply a little paste wax inside the dado. This significantly decreases the friction and allows the guide to slide back and forth. Just a little on the head of toothpick works. I choose not to finish these, as they’re designed for hot metal object that could actually burn into the wood some. I’ve also built a glue-up jig so I can glue a total of 2 sets of bases (3 bases each trivet, 6 bases total) at a time. base and sides are taped. 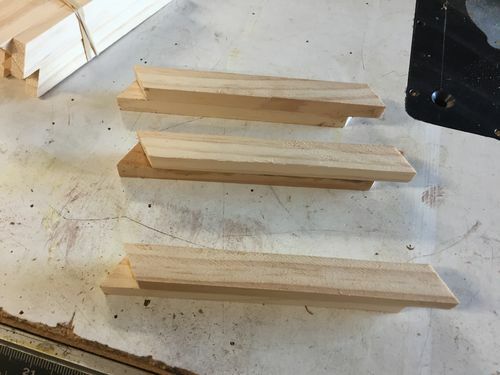 I also build a drilling jig for getting the dowels right. Let me know if you have any questions. I’m still in the process of building these for Christmas gifts, so if needed I can take/add more pictures. As always, questions/comments/suggestions are always welcome. 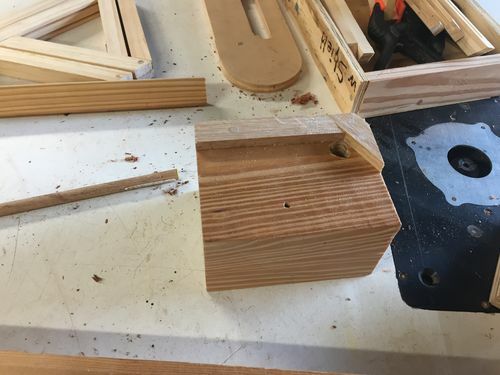 One final note; I found that the dado needed to go completely through the leg for all the pieces to fit once assembled. I ONLY wasted 4 sets before making this discovery (sigh). Finished this Christmas with 25 pieces, 2 of which were done in cocobola. Thanks for the comments and the compliments.